It is very easy to set up a new AfricaBet account. In order to place your bets at AfricaBet you must first register a new account. You can sign up by filling in the player registration form. It is very important that you provide us with correct personal information so that we can provide you with the best online betting services. The company reserves the right to deny customers who provide false information as well as refuse them the payment of any winnings and/or money withdrawal requests. At any time the company may request additional information from any user. Upon request, the user is obligated to provide an official document in order to prove their identity such as a passport, driver's license or identity card. Once the user has registered and was approved by AfricaBet, they will be provided with an account to be used by the registered person only. 2. What Currency can I use? AfricaBet is one of the few companies that allow you to choose a currency of your choice. On registration select a currency you want to use. Once you have selected a currency you want, you will not be able to change it at a later stage. 3. How do I deposit money? AfricaBet has secure payment gateways for you to deposit money into your account. You can deposit using Visa, Mastercard, Bitcoin and various Mobile Money options from different operators throughout Africa. We are always looking for better methods of payment. 4. How do I withdraw money? Simply click on your Username, > Withdraw and enter the amount you want to withdraw and your money will be transferred into your account. 5. How do I cancel a withdrawal request? If you want to cancel your withdrawal request, you are able to do it before it is processed. Click on your username > withdrawal, then choose the withdrawal request that you want to cancel. Your money will be transferred back to your gaming account within a few minutes. 6. How do I place a bet on Sporting Events? We have various incredible betting products with the most exciting large variety of options. Click on “Sports”, “Live Sports”, “Live Games”, “Casino”, “Live Casino” and “Lottery Products”. You can then choose from all the various world class products we offer and you can start enjoying your experience with AfricaBet. Once your bet is in the Bet Slip, you can enter the amount of money you wish to wager on your selection by typing a number into the 'Stake' box. You can add up to 8 single bets on one Bet Slip. As soon as you are satisfied with your selection, click 'Next'. Note: You must be a registered Africabet user in order to place bets. 7. How do I Place a Multibet Sporting Events? To place a Multibet, you must first select at least two different outcomes of different events. This will enable the Multibet tab in your Bet Slip in the top right corner of the page. You can now navigate using the 'Sports Categories' menu on the homepage or by browsing through the markets in the 'Popular Bets' and 'Last Minute Bets'. Add your bets to the Multibet Bet Slip by clicking on the odds you wish to bet on. As you add bets to your Bet Slip you will notice the 'Total Odds' changing. Once you have added your bets to the Multibet Bet Slip you can enter the amount of money you wish to wager on your selection by typing the amount into the 'Stake' box. You can add up to 30 bets to your Multibet. If you add more bets to the slip you will notice the 'Potential Winnings' change according to the 'Total Odds'. Once you enter all the bets, check to see if you‘re satisfied with your selection, and if you are, click 'Confirm'. 8. How do I place a system bet Sporting Events? In order to place a system bet, you must first select at least three different outcomes of different events. This will enable the System tab in your Bet Slip in the top right corner of the page. You can now navigate using the 'Sports Categories' menu on the homepage or by browsing through the markets in the 'Popular Bets' and 'Last Minute Bets'. Add your bets to the System Bet Slip by clicking on the odds you wish to bet on. Once you have added your bets to the System Bet Slip you can enter the amount of money you wish to wager on your selection by typing the amount into the 'Stake' box. Below the 'Stake' box you will see check boxes that allow you to select the type of system you wish to bet on. You can add up to eight bets to your System bet. If you add more bets to the slip you will notice the 'Potential Winnings' change along with the types of Systems available for betting. 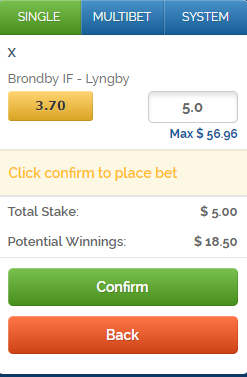 As you change the System bet type you will notice your 'Overall Stake' and 'Potential Winnings' change as well. Once you enter all the bets, check to see if you‘re satisfied with your selection, and if you are, click 'Confirm'. 9. What if I want to learn more about a product or option? 10. How long does it take for bets to be settled? We aim to settle your bets as quickly as possible. Our customers are our highest priority at AfricaBet and therefore we do our best to process all the bets in time. A delay could occur due to the requirement of official validation for the outcome of the event. Should you encounter any issues with the settlement of your bets, please contact our customer support department who will rectify this as soon as possible. 11. How do I follow my transactions current bets and results? You can access these options whilst logged in to your account. 12. How do I Adjust my Account Settings? By clicking your username button and selecting ‘Profile’, you can view your account settings as well as upload documents, change your password, limit your losses, deposits, and wager amounts; self-exclude yourself from gambling at AfricaBet and disable your account. 13. Is My Data Safe with AfricaBet? 14. Why can I no longer access my AfricaBet Account? 15. How do I use my free bet? Once a Free Bet is credited to your Africabet account, you need to choose the event you’re going to bet on and you will be able to see the Free Bet option in the bet slip immediately. 16. Can I cancel my bet? No. Once a bet has been confirmed, it cannot be cancelled..
17. Do I need a separate account for sports betting, casino and lottery products? No. One account covers it all – while logged in, you will be able to bet on any sports, play in the Casino or give lottery products a go, as well as use any other services you see in the Africabet website. All the funds in your account will be accessible for any of and all of the games.